The history of Aiki in Japan goes back about a 1000 years. Back to the days of the samurai, when feodal lords battled it out in numerous wars and battles. The root is of course even older, and stems from China where it is called T'ai Chi (Ai Ki). Minamoto no Yoshimitsu (1056-1127) was the first warlord, to organize and chart the Aiki system. His son Yoshikiyo continued the fighting system under the family name Takeda in the provincie of Kai. The system was to become known as Takeda-ryu Aiki-no-jutsu. All Takeda samurai were trained according to the Takeda-ryu Aiki-no-jutsu system and the school went on from generation to generation, until the 16th century. Inside the Takeda Ryu ("school"), the samurai were taught the complex art of war, including many more martial disciplines as Jujutsu, Aikijutsu, Ju-Kempo (fighting with empty hands, based on suppleness principles), Iaido / Kenjutsu (the art of drawing and fighting with the sword), Jodo (stick fighting), Shugi Jutsu (the fight with batons of different dimensions), Shuriken Jutsu (cutting blades). But also the elements of Heiho Jutsu (military strategy and tactics), Ba Jutsu (the riding art), Bujutsu Ido (traditional medicine), infiltration and espionage tactics (Shinobi Jutsu). Takeda Nobutora (1493-1573) was leader of the Takeda clan, and Daimyo of the province of Kai. The father of Takeda Katsuchiyo. 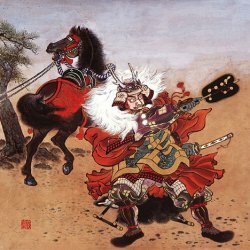 Takeda Shingen (1521-1573) was born Takeda Tarō (Katsuchiyo), but was later given the formal name of Takeda Harunobu authorized by Ashikaga Yoshiharu, the 12th Ashikaga Shogun. He changed it to Shingen in 1551. He was victorious in many battles, until at a decisive engagement died in his war camp before he could resolve the almost complete victory over Tokugawa Ieyasu which could have made him the ruler of Japan. Takeda Katsuyori became the Daimyo of the Takeda clan and desired to continue the legacy of his father. He moved on to take Tokugawa forts. However an allied force of Tokugawa Ieyasu and Oda Nobunaga dealt a crushing blow to the Takeda in the Battle of Nagashino. 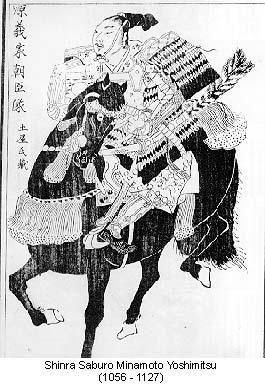 Oda Nobunaga's gunmen destroyed the Takeda cavalry. Ieyasu seized the opportunity and defeated the weak Takeda led by Takeda Katsuyori in the Battle of Temmokuzan. Katsuyori committed suicide, and the Takeda clan did not recover from this defeat. Takeda Kunitsugu of the Minamoto clan fled to the province of Aizu, thus bringing the knowledge of the Takeda-ryu to the Aizu clan. Some Takeda members remained in Kai continuing the development of the system in secret until not so long ago. The Takeda ryu is again publicly active, in Japan but also throughout the world. The Aizu clan passed down the original Takeda system from father to son for many generations within the Aizu clan until the fall of the Shogunate in 1868. The system developed slightly differently than the original Takeda system. In the nineteenth century aiki-jutsu emanated into the public light, due to the efforts of Sokaku Takeda, Saigo Shiro, and others. Takeda was taught a form of aiki-jutsu called Daito-ryu by the last surviving minister of the Aizu clan, Tanomo Saigo and Saigo Shiro. 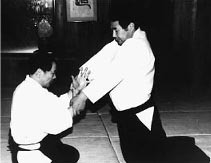 Takeda eventually began teaching aiki-jutsu to anyone who qualified. Some of his students went on to become distinguished masters in their own right. Young Sool Choi modified what he learned into the art of Hapkido. Morihei Ueshiba founded the modern softer martial art of Aikido. Takeda Kunitsugu (1551-1592) brought the Takeda system to Aizu. Aizu and Minamoto clans merged. The origin of Daito-ryu starts with Soemon. He taught a system called aiki-in-ho-yo which he passed on to Saigo Tanomo. Saigo Tanomo (1829-1905) was student of Takeda Saomon, and sixth generation of the Emperor Seiwa. The system was still called Oshiiki Uchi, but he was the second generation to use the term Aiki. 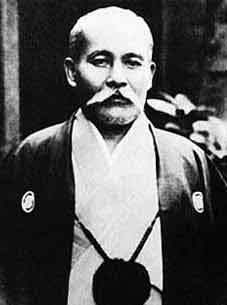 Saigo Shiro (1867-1922) was one of the first students of Jigoro Kano (creator of Kodokan Judo and the mudansha and yudansha ranking system). 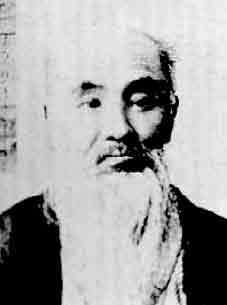 Takeda Sokaku (1860-1943) was known as the founder of a school of jujutsu known as Daito-ryu Aiki-ju-Jutsu. Born in the Aizu domain (Fukushima Prefecture), grandson of Takeda Soemon. Takeda Tokimune (1916 - 1993) was the son of Sokaku Takeda, and inherited the Daito-ryu system from his father. He was responsible for introducing Daito-ryu outside Japan. Kondo Katsuyuki - current Soke is the only one with a menkyo kaiden rank received from Takeda Tokimune. Hisa Takuma Ueshiba Morihei was student of Takeda Sokaku, and founder of Aikido. Derivatives of the Daito-ryu branch, in the form of specific styles (iaido, kendo, kempo, hapkido, judo, ju-jutsu, aikido, etc...) started to evolve during the 19th and 20th century. Both original schools still teach the complete systems. Ueshiba Sensei formed a system of his own from the original Daito-ryu-Aiki-ju-jutsu techniques he acquired from Sokaku Takeda, first called Aiki-budo and eventually Aikido. Harmony and religion were central. 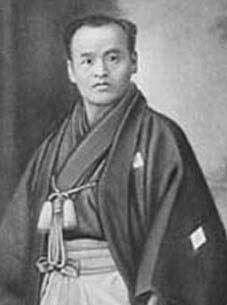 This Aikido came to the West through students of Ueshiba Morihei, such as Saito Sensei and Tohei Sensei. Peter Nunes d'Agrella studied many martial arts (See About us), and is the founder of Aiki Jutsu Do. By combining the strong aspects of Aikido, Takeda-ryu Aiki-no-jutsu, Muay Boran and all things gathered throughout my martial arts journey, the Aiki Jutsu Do system became the next step. It took 40 years to get to the point where Peter was finally satisfied with it all. Naturally, many new ideas were conceived and over time perfected. There are many movements and techniques unique to Aiki Jutsu Do. Things the traditional arts and derivatives thereof never came to because they stick to tradition or just didn't get it. The result is a flexible, alert, dynamic, and above all realistic and effective in nature self defense system for the modern age. And maybe most important of all a new way of learning. And yes, several unique movements (techniques), were formed that make it the ultimate self defense system. And it is usable in everyday life, not only for those who have a license to kill. © Peter Nunes d'Agrella. All rights reserved.